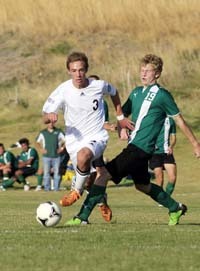 Wood River High School’s boys’ and girls’ soccer teams clinched berths in the State 4A soccer tournaments Thursday by winning their second-place games in the Great Basin Conference tournament. Senior Alex Lopez scored in the first half and Wood River’s sturdy defense shut down the host Minico Spartans in a 1-0 triumph in Rupert. In Hailey, Wood River’s girls opened up a 3-0 halftime lead and breezed 4-1 over a Jerome team saddened by the sudden death of the mother of its leading scorer, Sarah Walker, on Wednesday. Junior Haley Montgomery scored two goals for the Wolverines. Wood River’s boys (12-1-4) open state at Idaho Falls Soccer Complex Thursday, Oct. 18 with an 11 a.m. game against eastern Idaho champ Blackfoot (13-1-1). The Broncos earned a return trip to state Thursday with a 2-0 victory over Century of Pocatello in the 5th/6th district title game at Century. Last year, Blackfoot (15-2-2) captured its first-ever Idaho High School Activities Association state tournament title 3-0 over Caldwell. Blackfoot beat Minico 1-0, Skyview 3-2 and Caldwell 3-0 to earn the title. Both GBC entries, Minico and Burley, went two-and-out. Wood River’s girls (11-6-0) debut the State 4A tournament Thursday at the same Idaho Falls complex with an 11 a.m. game against Century. The Diamondbacks scored all three of their goals in the first half and won the 4A 5th/6th district championship Thursday 3-1 over Preston in Idaho Falls. Last year at state, Century eliminated Wood River 2-0 after the Wolverines dropped their opening game 5-1 to Hillcrest of Idaho Falls. Century went on to capture the consolation championship title 6-0 over Kuna. Only three teams have won IHSAA 4A girls’ championships in 11 years—Sandpoint (5 titles), Bishop Kelly (3) and Century (3). Last year Bishop Kelly won its second straight 4A title and fourth in five years 3-2 in overtime over 2009 winner Sandpoint. This year, however, Moscow eliminated Sandpoint 2-1 Thursday at Sandpoint to earn its first state tournament berth since 2008. ( Boys at Idaho Falls: At 11 a.m., Blackfoot (13-1-1) vs. Wood River (12-1-4) and Sandpoint (11-5-2) vs. Bishop Kelly of Boise (10-6-3) in the upper bracket; at 2 p.m., Skyview of Nampa (16-1-2) vs. Century, and Jerome (10-1-6) vs. Middleton in the lower bracket. ( Girls at Idaho Falls: At 11 a.m., Century vs. Wood River (11-6-0) and Moscow vs. Kuna in the upper bracket; at 2 p.m., Bishop Kelly (19-0-0) vs. Preston and Twin Falls (16-2-0) vs. Middleton (13-6-1) in the lower. The Wood River boys captured their second straight 1-0 win Thursday and avenged a shootout loss to Minico exactly one year ago that ended the Wolverine season. Lopez (a team-high 9 goals), held scoreless for three games, tallied his seventh game-winning goal on a 16th minute header. No. 4-seeded Minico (7-9-3) couldn’t penetrate the rock-solid Hailey defense led by Trevor Brand and Zack Freeman. It was Wood River’s 11th shutout in 16 games. With the win, Wood River secured the program’s 20th state tournament trip in 26 seasons and ended up winning three of its four games with Minico played in 2012. No. 2-seeded Wood River needed to win Thursday’s GBC second-place game against No. 4-seeded Jerome (9-10-1) on the Hailey pitch to earn its 18th straight trip to the state soccer tournament. It was an emotional contest for Jerome, played one day after the sudden death of Kathy Walker, 57, the mother of Jerome leading scorer Sarah Walker. Sarah elected to play the game and performed well, as did her fired-up teammates encouraged by an enthusiastic rooting section. Yet Wood River got the early momentum it needed when sophomore sweeper Timber Kelly rattled home the first goal after a corner kick from Allison Gasenica just four minutes into the game. It was the first goal of the season for defender Kelly, who tallied three as a freshman. Kelly spent the rest of the game tangling with dangerous striker Sarah Walker, and Kelly more than held her own. A smart midfield play started by freshman Tayte Kelly sent the ball to Samantha Sutton, who passed ahead to Montgomery—Haley deking a Tiger defender and blasting the second goal at 14 minutes off the save attempt of Tiger goalie Taylor Hill (10 saves). Jerome, trailing 2-0, started applying tons of pressure at the end of the first half but Wood River’s defense of Timber Kelly, Maggie Williams, Olivia Thornton and Caitlyn Sfingi was strong in front of senior goalkeeper Kaina Chapman (4 saves). Then, in the 39th minute, Montgomery provided the Wolverines with a 3-0 halftime lead on a header from another Allison Gasenica corner kick. Wood River, out-shooting Jerome 15-7 for the game and 8-1 in corner kicks, had to withstand another Jerome threat early in the second half. Chapman made a great save on Sarah Walker at 44 minutes, then Sfingi blocked two legitimate Tigers shots in the box. Defender Williams departed with a sprained ankle at 58 minutes, and Jerome freshman Gaby Cervantes got behind the Hailey defense for a goal making it 3-1 at 66 minutes. The game was delayed 25 minutes when Jerome junior Jordyn Giltner broke her leg at 69 minutes. After it resumed, at 78 minutes, senior Allison Gasenica collected her third assist with a beautiful lead pass that sent Brigette Thomas in alone for the 4-1 final. Wood River coach Jenni Conrad, aware beforehand that Jerome was playing with heavy hearts, said afterward, “It was a real emotional game.